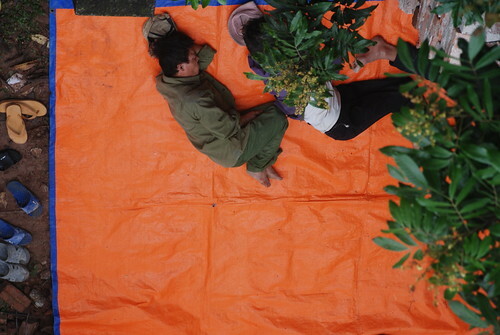 I am sure many Vietnamese and westerners have seen these activities many times. A few days ago, from my bathroom window I noticed (and heard!) that something was happening. The beautiful old house with the amazing garden behind us was being knocked down and will be soon replaced by two tall houses. I couldn't believe that the whole big two storey house was demolished by only six workers in just two days. There are two men and two women whose job it is to transfer waste from the house, including plants and rocks, by push cart. 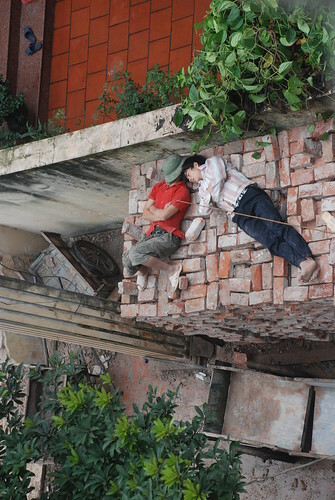 In between, the remaining two men continue to knock down the rest of the house and try to take all the cement around the old bricks so that they can be re-used to build new houses. I wonder if it's safe to re-use these old bricks which have been used for over 15 years? 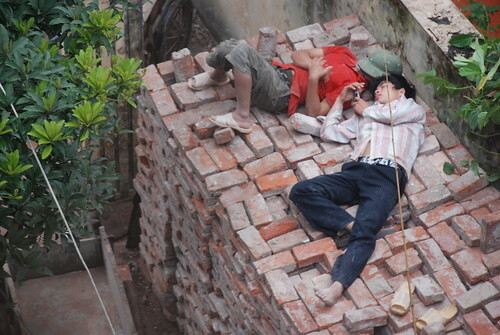 During lunch time, they eat on the ground and sleep on the top of the old bricks. Some of them play with their mobile phones and chat with friends, the rest try to take a short nap before getting back to hard work again. I am not sure how much they earn, maybe not much but they don't really look tired or unhappy. One of them realized that I was taking their photos and they hide their faces but two of the women were laughing out loud. It's really good to see these hard workers laughing. It's not an easy or well-paid job. I wish them all the best of health, luck and happiness. Hoi An today is far different to the Hoi An I knew in the past. Compared to even a few years ago, it is full of shops and hotels. 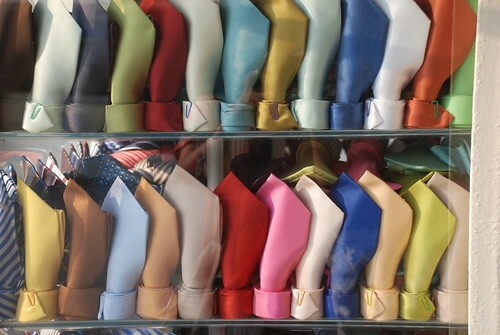 In a hundred metre stretch of road, there are more than 10 shops selling the same stuff and making the same clothes. It's a bit annoying as the old ancient town is slowly disappearing, replaced by these modern activities. Most of the hotels in Hoi An call themselves "Resorts" but the quality is far away from the meaning of the word. Basically it means they can create their own prices, mostly really over the top expensive. I don't know how they can get their permits to do business. I remember 2 years ago, the hotels usually started at between $15 to $25 per night with a swimming pool and breakfast included but these"Resorts" are charging up to $56 to $85 per night which is too much. I refused to pay that much not because I cannot afford it, but rather that they are not worth that money at all. 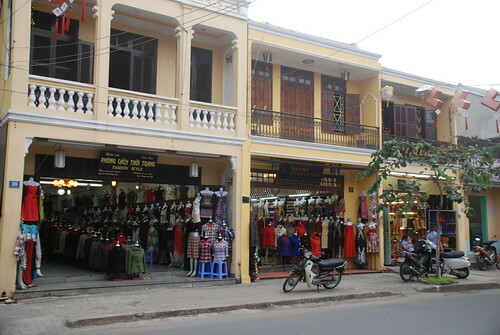 Unfortunately, these days small Hoi An old town has far too many tourists. The big tour groups, buses and noise makes it feel like I am in Hanoi or Saigon. Of course, in the short term its good for the local people as tourism has created jobs and improved their standard of living. 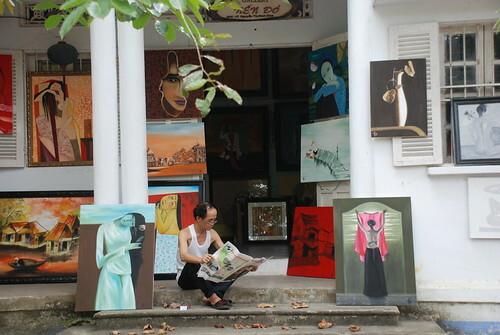 But sooner or later, Hoi An might suffer as most of the interesting parts are slowly disappearing and people may lose their interest in visiting there. The number of tourists is increasing so fast which means Hoi An people are getting more commercial minded and not always in a good way. Even though they remain friendly and nice on the surface, I still there is something different in their talk and their reactions when people shop. The charm of the Hoianese is disappearing step by step and is being replaced by modern, western thinking. 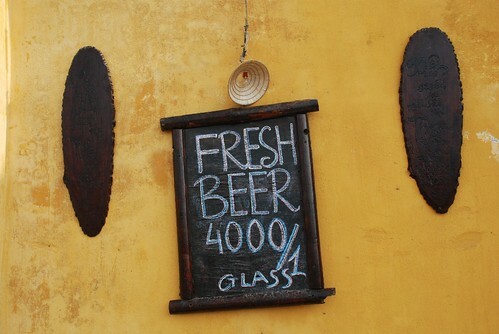 I hope Hoi An local council considers limiting the numbers of shops, bars, restaurants and "Resorts" and tries to maintain the great old houses around. I am in Hoi An for a few nights with my ex colleagues. I made a really long list of MUST eat food in the old ancient town to try. 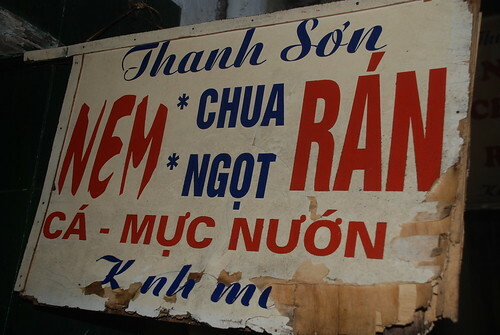 I also would like to have some summer clothes made there as they're quite cheap compared prices in Hanoi. I'm staying at the Trade Union hotel for the first time and, so far so good. This is not a very expensive hotel compared to others in town but it's in a good location. Hoi An today is crowded all the time, full of western tourists and Vietnamese tourists on weekends. It's actually not as relaxing as I remember it but still nice to escape from the busy traffic and crazy noise of Hanoi. I will try to post some articles about Hoi An in the next few days. Hope everyone has a great week at work!!! My friends usually go out in the evening after their dinner for a snack and a chat. 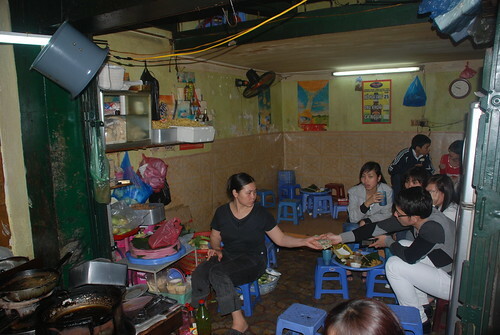 Last week, they invited me out for Nem Chua Ran - deep fried fermented pork in Tam Thuong Lane. There are lots of small shops selling this snack around Hanoi but it seems the most popular area is in Tam Thuong lane in the middle of Hang Bong street. It's a good snack for a change but you wouldn't want to eat it every day as it's quite high in fat. I am sure I will come back for more as it is quite cheap and something that you can dwell over for a long time for a good chat. Definitely worth exploring this little lane in the Old Quarter.